روحی دهبنه, مجید. (1397). تحلیل ژئوپلیتیکی رقابت های ایران و ترکیه متأثر از تحولات خاورمیانه از سال 2011 میلادی. فصلنامه بین المللی ژئوپلیتیک, 14(49), 113-147. مجید روحی دهبنه. "تحلیل ژئوپلیتیکی رقابت های ایران و ترکیه متأثر از تحولات خاورمیانه از سال 2011 میلادی". فصلنامه بین المللی ژئوپلیتیک, 14, 49, 1397, 113-147. روحی دهبنه, مجید. (1397). 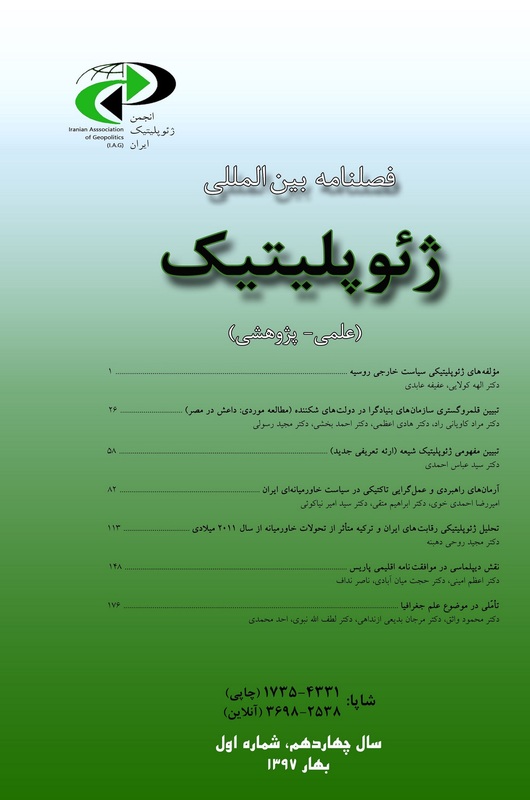 'تحلیل ژئوپلیتیکی رقابت های ایران و ترکیه متأثر از تحولات خاورمیانه از سال 2011 میلادی', فصلنامه بین المللی ژئوپلیتیک, 14(49), pp. 113-147. روحی دهبنه, مجید. تحلیل ژئوپلیتیکی رقابت های ایران و ترکیه متأثر از تحولات خاورمیانه از سال 2011 میلادی. فصلنامه بین المللی ژئوپلیتیک, 1397; 14(49): 113-147. فضای خاورمیانه از سال 2011 با تغییرات و دگرگونی‌های مهمی مواجه شده است. یکی از آثار مهم این دگرگونی‌ها که پویش منطقه‌ای خاورمیانه را تعریف کرده است، رقابت‌ و منازعه سه ضلعی شکل گرفته بین ایران، عربستان سعودی و ترکیه است که از زوایای مختلفی قابل تبیین و ارزیابی است. یافته‌های پژوهش حاضر نشان می‌دهد از دو نوع رقابت متصور بین دولت‌ها؛ یعنی رقابت استراتژیک و رقابت غیراستراتژیک، ماهیت و یا چیستی رقابت بین ایران و ترکیه را می‌توان رقابتی غیراستراتژیک نامید؛ بدین معنی که دو طرف، یکدیگر را خصم و تهدیدی علیه امنیت ملی خویش تصور ننموده‌اند، ولی به​دلایل ژئوپلیتیک و ایدئولوژیک درگیر رقابتی مکانی (بر سر سرزمین، منابع)، موقعیتی (بر سر قدرت نسبی، موقعیت سیاسی- اقتصادی و نفوذ سیاسی بر منطقه) و رقابتی ایده‌ای (بر سر تحمیل و یا القای ایدئولوژی خود) شده‌اند. گرچه شروع این رقابت‌ها به​صورت جدی‌تر از سال 2003 میلادی و از عراق پس از صدام آغاز شد، اما با رسیدن عرصه تحولات به سوریه، با توجه به نگرانی‌ها و الزامات ژئوپلتیکی و ایدئولوژیک شدید دو بازیگر، رقابت شکل عمیق‌تری به​خود گرفت؛ به​گونه‌ای که در یک فضای رئالیستی درگیر رقابت بر مبنای برد– باخت شدند. The Arab Spring, which began in Tunisia and then swept through many Arab countries, began the launch of Iran and Turkey moves to play the role of superior regional power and compete for their desirable order. With these transformation, and in particular the crisis in Syria and Iraq, the two countries were affected by different, and sometimes opposing, national, regional, and ideological contradictions and the effects that these changes could have had for them in terms of win and lose, enter the realm of competition the head of influence, power and regional hegemony. This research, using an analytical- descriptive method and based on valid data, attempts to identify and analyze the reasons, motivations and the nature of Iran-Turkey competition in the Syria and Iraqi crisis. 1. The two countries of Iran and Turkey have long been rivals and even Ottoman times. In the Pahlavi era, competition between the two countries was reduced. During the eight-year Iraq war against Iran, there was little room for competition. After the 1990s, by 2011, the two countries competed in different fields, which Iraq was the most important. The Arab Spring revived the rivalry between the two countries, and the Syrian crisis reached its peak. 2. Important factors such as changes at the Turkish internal level, in particular the work of the AKP, regional changes and the shift in the balance of power in favor of Iran, and ultimately transnational factors, the rivalry between the United States and Russia, as well as Obama's doctrine, in the intensification of competition, they played a very important role. 3. In Syria and Iraq due to its geographical significance for the both Iran and Turkey and its effects on the national security of the two countries, the competition has become profound. It was become a win-loss game for two actors. 1.The Nature of Iran-Turkey Rivalry in Iraq and Syria, can be Called Non -Strategic Competition. In other words, they didn’t compete with hostility and the sides did not design their Doctrine against each other. So competing in the form of competition can be evaluated and analyzed so that Rivalry. 2. The two countries of Iran and Turkey shaped the spatial competition for maintenance control and influence in Syrian conflict, because of the geopolitical importance of Syria and its role in reducing and increasing the power of the two countries. 3. Iran and Turkey as the two emerging powers sought to build a new region in accordance with their will and desires and therefore shaped a situational competition in the direction of influence, power and regional hegemony. 4. In the context of an ideological competition as well Turkey had put soft Islamic discourse in its agenda in the region after 2011, And the Islamic Republic of Iran also led revolutionary Islamic discourse and would have liked to win this discourse in the region, there for the competition between the two discourse on a desirable regional order, shaped an ideological rivalry between the two countries in Iraq and Syria. The research results show that the two countries of Iran and Turkey have shaped a significant competition over the relative power share of the new regional fabric after the new developments in the Middle East. The events of Iraq and Syria culminated in the competition. Studies also show that in these cases ideological, geopolitical and economic considerations have been important. The common case of all of these competition has been security concerns. While the regional balance of power in favor of Iran and internal changes in Turkey have played a very important competitive game.